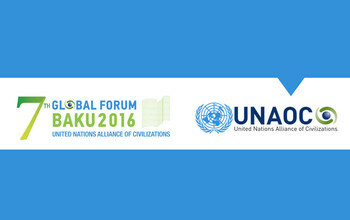 The United Nations Alliance of Civilizations (UNAOC) will be organizing the next Global forum in Baku, Azerbaijan (April 25-27, 2016). The UNAOC Global Forum is the flagship event of the United Nations Alliance of Civilizations, a political initiative of the UN Secretary General aiming at forging collective political will and mobilizing concerted action in order to improve cross-cultural understanding and cooperation among countries, people, and communities. UNAOC Global Forums are hosted by UN member states, this year Azerbaijan, and in the past by Spain (2008), Turkey (2009), Brazil (2010), Qatar (2011), Austria (2013), and Indonesia (2014). Over the course of two days, political leaders including heads of State and Government, Ministers and senior officials, civil society activist and Nobel laureates, corporate executives, religious leaders and leading scholars, will dialogue and debate with each other, launches practical initiatives and make commitments to action aimed at improving relations across religions and cultures. The overall theme for this Forum will be “Living Together in Inclusive Societies. By stressing the “inclusive” aspect of “living together,” the UNAOC 7th Forum will harness the multiple perspectives of various sectors to meet the challenge of, and progress towards, inclusive living in today’s increasingly diverse societies.